How to SKYROCKET your Affiliate Income in 5 Steps! With our newly expanded Affiliate Hub, now is the perfect time to ramp up your marketing as a WPX affiliate and make some serious cash! Plus, as our many reviews show, you can trust your audience with us while also making serious money. Everyone’s a winner! The more recommendations you make and the more sign-ups you bring to us, the more your commissions will grow! AFFILIATE TACTIC #1: Add a Testimonial Link to your Email Signature. The email signature is one of the most overlooked and underused elements in online marketing today. Serious marketers however, know just how this ‘silent salesman’ can consistently deliver for you – if done well. Obviously, the text must reflect your experience with us sincerely, though we are the only hosting service recommended by Thrive Themes, for example. In short, if you use email marketing, making the most of your email signature is a perfect opportunity to earn more from what you are already doing. AFFILIATE TACTIC #2: Strategic Banner Placement across your Website. If you’re using a service like Hotjar or Crazy Egg, you should know where your website’s visitors are most likely to click. The most visually popular places on your website are the perfect ‘hotspots’ for WPX banners. This is a fast and easy way to drive additional clicks, which lead to referrals, which lead to commissions! IMPORTANT: If you are not sure how to add our banners to your websites, our Support Team can do it for you quickly and without charge. Just ask Iva, your WPX Affiliate Manager or go straight to the WPX Support Team. AFFILIATE TACTIC #3: YOUR Testimonial/Review fit for YOUR Audience. Thrive Themes are currently the #1 affiliate for WPX Hosting - but maybe you can beat them! Their success has come solely from this page on their site. Notice how detailed their review is? When you have earned the trust of your audience, they will want to hear what services, products, and companies you recommend - especially based on your own personal experience, in your own words. In our business, we use many different tools, services, and companies but reading a recommendation from someone we trust goes a long way towards convincing us to try out something new. Your audience is no different and word-of-mouth recommendations are arguably still the most powerful form of marketing going. Of course, once you create such a review or testimonial (including your embedded affiliate links), you must still generate traffic to that page through your email marketing, Facebook promotion, or other means. AFFILIATE TACTIC #4: Prepare a Pre-Written Email (Series). Email is still #1 when it comes to engaging with your audience. Apart from a powerful email signature as discussed above, sending relevant and educational content about WPX Hosting can also be very effective, if done well. In fact, if you combine a good email signature, plus your testimonial/review, plus an email or email series, you can cut through the inbox clutter to reach your audience. 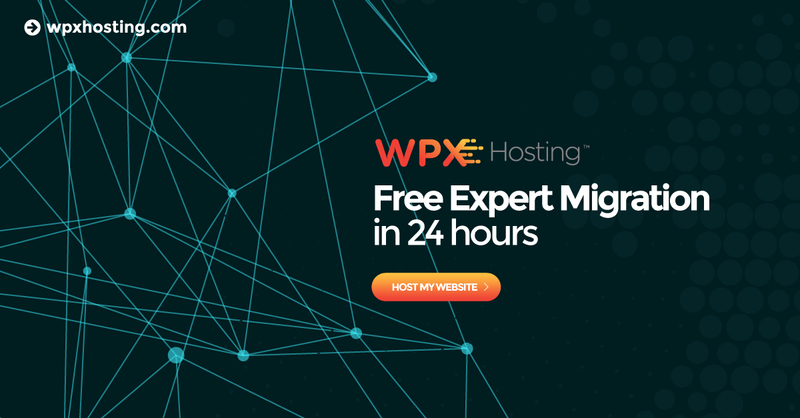 “This Black Friday, I only recommend WPX Hosting, not just for their massive 96% savings on all shared hosting plans, but also for their lightning fast service and support! WPX also have the largest number of free features out of any hosting company, including free migration and security. Why do I recommend WPX Hosting? They are a premier hosting provider and are famous for their legendary customer support and premium service quality. Whether you need to accommodate a blog, portfolio, or e-commerce website, they have everything you need right from the beginning. You will know the right style and tone for your audience, whether they prefer a more factual or dramatic approach. Also, your email (series) could cover a number of relevant topics; you could choose to cover general website tips, pre- and post-WPX comparisons, or even a run-down on WPX’s array of free features and how they impact running an online business. AFFILIATE TACTIC #5: Interview Terry Kyle, CEO of WPX Hosting. WPX Hosting is a business run by diligent, creative, and cooperative people. But most importantly, it’s run by real people. Terry Kyle, our CEO, has gathered together a superstar team, working hard to deliver the superior hosting experience Terry had envisioned years ago. He’s proud of their achievements and the work that has been put into WPX over the years but Terry’s story goes back much further. As a marketing and SEO leader, Terry’s got a lot to share and he’s more than happy to talk and answer the questions of fellow bloggers and entrepreneurs. Shoot an email requesting an interview to either Iva (your Affiliate Manager) or to Terry himself via support(at)terrykyle.net, and then feature your discussion on your website or blog. So, these are 5 killer tactics that you can implement right now to start earning (much more) as a WPX Hosting affiliate!